The bothriolepidid placoderms Bothriolepis markovskii sp. nov. from the southern Ural Mountains and Bothriolepididae gen. et sp. indet. from the Kuznetsk Coal Basin are described. The new species from the southern Ural Mountains has a high dorsal crest, resembling in this character Scottish B. cristata Traquair, Australian B. gippslandiensis Hills and B. cullodenensis Long, and B. heckeri Lukševičs from the Novgorod Region. The bothriolepidid from the Kuznetsk Coal Basin is similar to Bothriolepis from central Poland and Livnolepis from European Russia. The new finds expand the diversity and distribution of crested bothriolepidid antiarchs. Apparently, the high bone dorsal crest developed in parallel in the exoskeleton of different both-riolepidid groups. Original Russian Text © S.V. 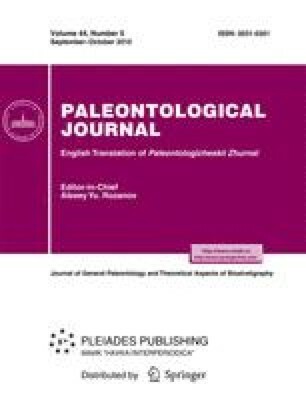 Moloshnikov, 2010, published in Paleontologicheskii Zhurnal, 2010, No. 5, pp. 79–83.